Hassle Free Septic – North Branch, MN – Hassle Free Septic is North Branch Minnesota. Septic pumping, septic maintenance, septic repair and drain cleaning. We show up clean. We leave things cleaner. Please fill out this form. You’ll hear from our friendly service team as soon as we can reach you. *We never share your information to any other party. Contact Hassle Free Septic Today for all Your North Branch, MN Septic Tank Needs! Hassle Free Septic is currently serving Chisago County, and parts of Isanti, Anoka, and Washington County areas with the lowest prices around for septic pumping, septic maintenance, septic repair and drain cleaning. 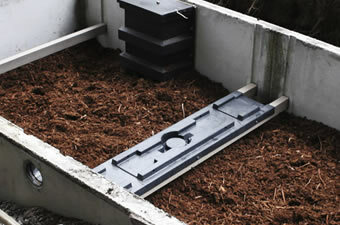 At Hassle Free Septic we are available for Same Day Service and Weekend Service. We have very affordable pricing and will answer your calls or promptly return a message. We promise to leave your house and yard as clean as we found it. An average septic tank needs to be pumped every two or three years. Please don’t wait until you have a $10,000 to $25,000 problem! Plan to get it pumped today! Call Hassle Free Septic for a free estimate or to schedule an appointment today! Do you need Hassle Free Septic or a plumber? Hassle Free Septic specializes in the waste removal and drain cleaning business. Plumbers or plumbing companies deal with a wide variety of services. It is hard for them to specialize in one specific field. Hassle Free Septic is your “one stop shop” for diagnosing the problem, removing waste and clearing your lines. We are committed to getting the job done right the first time and never leave the job site until everything has been thoroughly tested and working. 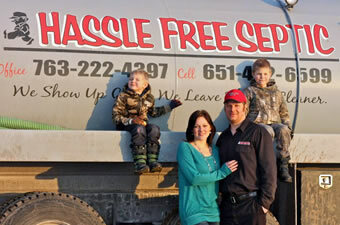 Hassle Free Septic is a family run business. At our core, we truly enjoy serving our customers. We do so with experience, courtesy, precision, and urgency. Your problem, is our business. Let us solve it for you. Contact us now, we’d love to hear from you. We take great pride in providing fast, reliable, professional and courteous service. Our technicians have received hands on training in the field and have years of experience. From the time you call our office to the time we leave your site, you will feel confident that your problem or situation will be resolved professionally and courteously. Call us today to speak with one of our septic system experts and hear what we can do for you. We offer free estimates. No job is too big or small for us and we’re ready to help.